Yes, it’s as delicious as it looks. It is also very easy to make and a crowd pleaser. I used kiwiberries because I like their combination of tart skin with the sweet flesh but regular chopped kiwi, banana, raspberries, blueberries, or any combination of fruit all work well here. 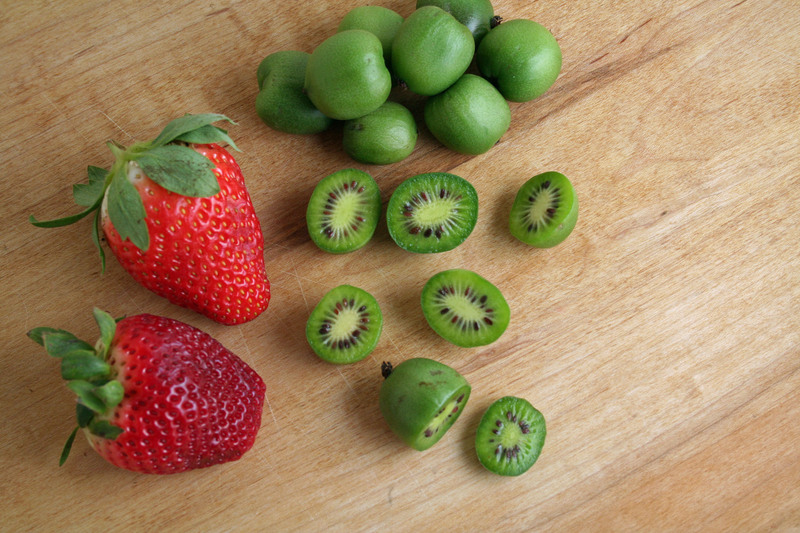 If you’re a kiwi lover but not familiar with kiwiberries, you should be. These miniature kiwis with fuzz free tart edible skin, may seem like baby kiwis but they are actually an entirely different fruit. Often from New Zealand, Kiwiberries or Hardy Kiwis can be difficult to come by and expensive. Here in NYC, they’re available at most gourmet food stores and according to Wikipedia (Kiwiberries on Wikipedia), more commercial production is now taking place in the U.S. so this “historically unsuccessful fruit” may become more available. If you’re a fan of sweet and sour combinations like I am, you should definitely try kiwiberries. You may be wondering if or how this recipe relates to Paula Peck and her cookbooks. Well, the recipe itself may not (no kiwiberries in the 1960’s, that’s for sure) but the inherent pound cake recipe comes directly from “The Art of Fine Baking.” I also think she would love the beauty and simplicity of this recipe, though she would probably add cognac or kirsch to the cream layers. Beat heavy cream until soft peaks form. Add vanilla and 1 tablespoon powdered sugar. Continue beating, gradually adding remaining sugar, until the cream holds stiff peaks. Beat in mascarpone cheese. 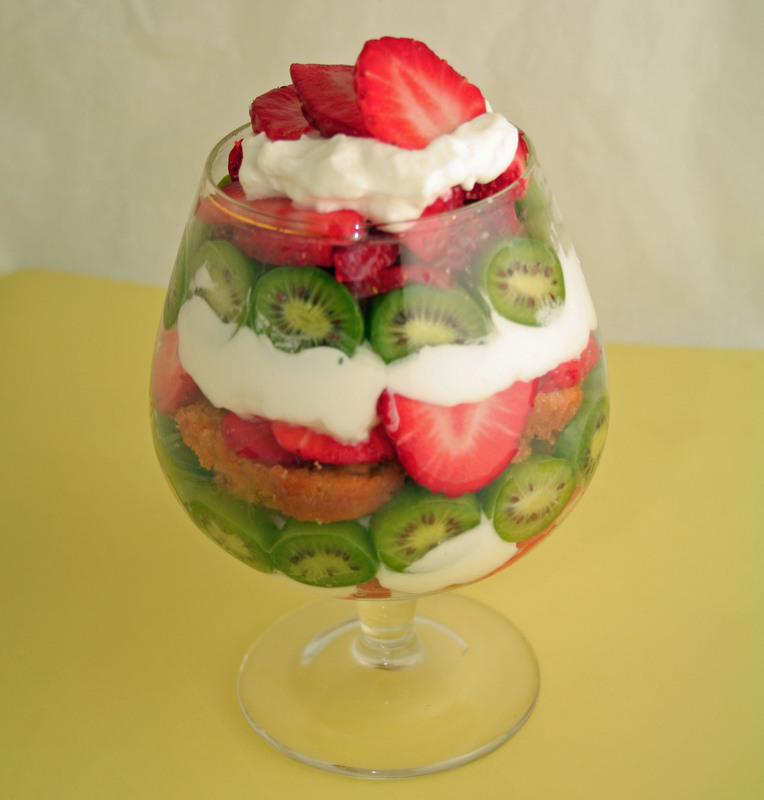 To build the parfaits: in clear dessert glasses, begin layering cake, cream, and fruit. Cover the bottom of the glass with 1-2 pieces of cake followed by a few dollops of cream. Build a ring of kiwiberries around the glass by sliding them down the side (cut side out). Add strawberries. 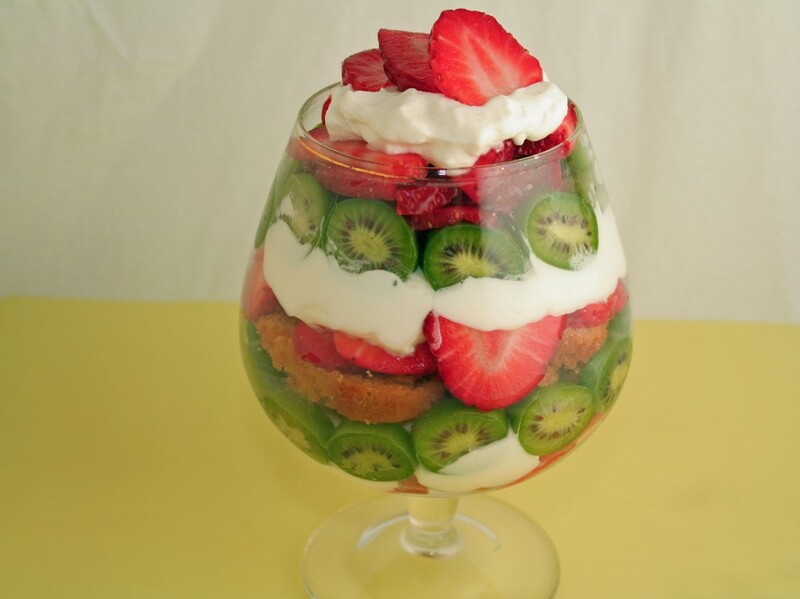 Continue layering and top with cream and strawberries. Preheat oven to 350 degrees. Grease a loaf pan and dust with flour. In a large bow, combine eggs and sugar. Beat for a minute. Set bowl over saucepan of hot water. Place saucepan over low heat for about 10 minutes, or until eggs are slightly warmer than lukewarm. Do not let water boil. Stir eggs occasionally while they are being heated to prevent them from cooking on bottom of bowl. While eggs are warming, cream butter and flour till light and fluffy. Add vanilla. When eggs are lukewarm, beat them until cool, thick, and tripled in bulk. Quickly stir 1/4 of beaten eggs into creamed mixture. Pour mixture over remaining beaten eggs. Fold in gently. Be careful not to over mix. Pour batter into prepared pan. Bake about 40-50 minutes or until cake is golden brown and pulls away from the sides of pan.